The Spirea 'Anthony Waterer', Spiraea x bumalda 'Anthony Waterer', has flat-topped heads of rosy-pink flowers that cover the top of this dwarf shrub, backed by bright green foliage. Attractive new growth is reddish purple. 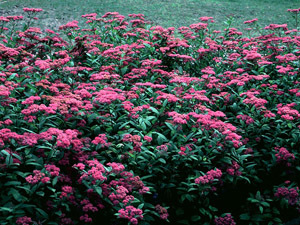 The foliage is deciduous and the leaves are a wine-red to maroon and the in the fall maturing into a dark green.This small plant can be used in the foreground of shrub borders.